With a chance of breaking into the Premier League top four on Saturday, Man Utd made no mistake as Paul Pogba gave them a three-goal lead at Fulham. The Frenchman had already opened the scoring at Craven Cottage in the first half with a thunderous strike from a tight angle, before Anthony Martial doubled the lead for the visitors. 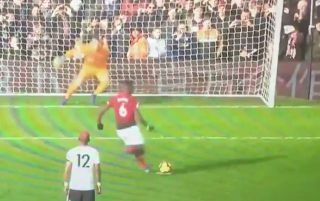 However, Pogba wasn’t finished there as he stepped up and produced a clinical penalty to put United 3-0 up and on their way to fourth place, as seen in the video below, temporarily at least with Chelsea not in action until Sunday when they face Manchester City at the Etihad. Nevertheless, it’s another sign of Pogba’s current confidence and decisiveness for the Red Devils, as he never looked in doubt of missing, even with his now infamous stuttered run-up. The 25-year-old has been fundamental to Ole Gunnar Solskjaer since he took charge on an interim basis in December, as he’s now scored eight goals and provided five assists in the nine Premier League games that the Norwegian tactician has been at the helm for.